A rumour about the spread of French “yellow vest” protests to other European countries went viral on Chinese social media before Christmas. The story emerged after French president Emmanuel Macron announced a number of concessions to address protesters’ grievances over economic policies. While Macron expected calm and order be restored, the Chinese-fabricated rumor predicted the opposite. Multiple versions of the story were spread via a number of micro-blogging accounts on Weibo and Wechat, quoting sources from a commodity wholesaler in Yiwu—a city well known as a wholesaling center—who stated that their entire stock of yellow vests in stock was sold out and more orders had been coming in from European nations such as Sweden, Prague, Switzerland, etc. 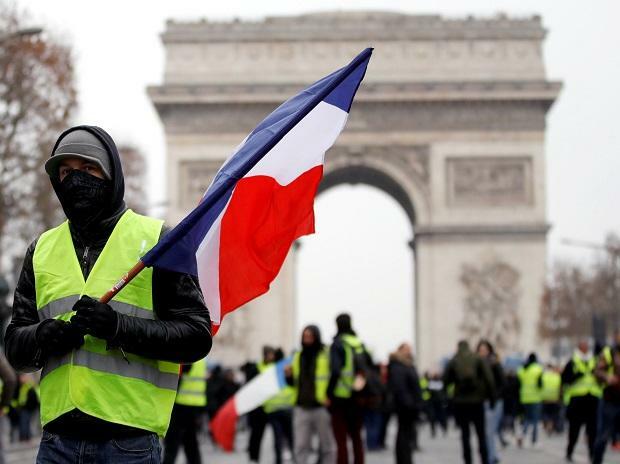 The story implied that the “yellow vest” protests were spreading throughout the continent. [Yiwu Index] Yiwu’s research report on clothing showed that orders of “yellow vests” from Europe has continued to surge. Manufacturers worked overtime to meet the demand and many traders from overseas e-commerce platforms see the movement as an excellent sales opportunity. Chinese netizens believed that based on the Yiwu commodity index and its big data, the yellow vest movement would spread to Sweden, Czech Republic, Switzerland and Spain. Foreign media outlets pointed out that the Yiwu Index could accurately predict international political trends. Commodity orders from overseas market could serve as indicators of public opinion and hence could accurately predict the results of political events. Back in 2016, based on the orders of election related t-shirts and flags, manufacturers from Yiwu had predicted Donald Trump would win the U.S. presidency five months in advance. Observers say that textile factories in Yiwu have started receiving orders from the U.S and have begun manufacturing flags and T-shirts for Trump supporters for the 2020 presidential election. The demand is now several times larger than orders from supporters of the Democratic Party. Some have started to predict that Trump would be re-elected. This shows the power of China’s big data. Located in Zhejiang Province, Yiwu is the world's biggest small commodities trading hub, and one of the most popular small commodities wholesale markets in China. Yiwu's international trade city has an Index called the Yiwu China commodity index that reflects market trends. During the US election in 2016, the Yiwu Index became a hot topic on Chinese social media, as discussions about election-related merchandise order records in Yiwu seemed to indicate that Donald Trump was more popular than Hillary Clinton. After the election, even state-affiliated media reported that commodity order records from Yiwu and Alibaba had predictive power, and many Chinese netizens believed that the Yiwu Index was more accurate than the US election polls. Some media observers were quick to point out that this interpretation was problematic, as Clinton, in fact, received more votes than Trump, but this analysis was ignored. This time, state-affiliated media outlet Global Times fact-checked the online story and reported that yellow vests were not out of stock in the trading city and that the sales volume in recent months was not higher than last year's. The Global Times report, however, has done nothing to stop the spread of the Yiwu Index myth. In fact, new commentary emerged after the Christmas reasserting the predictive power of Yiwu Index. The story, republished on various online media platforms, did acknowledge the erroneous sales figures for yellow vests, but continued to insist that the Yiwu Index had successfully predicted the results of both the 2016 U.S presidential election and the 2018 World Cup. The reason Yiwu can “accurately predict” the trend of global affairs, again and again, is due to the Yiwu people’s contributions in the past few decades. They have walked a distinctive path in the world’s commodity markets and established the city’s leading status as the manufacturing hub of world’s daily necessities. Open door and reform policy has helped numerous cities like Yiwu to take courageous steps and strike out for success. Their efforts have brought about the great transformation of China in just 40 years. This intertwining of the predictive power of the Yiwu Index with China's economic transformation has made the myth even more difficult to debunk.